You probably already know by now that cloth pads are better for the environment and you may also know that they are better for you too, but, you’re still uncertain about making the switch. Sounds familiar? Read on? There are many reasons why switching to cloth pads is the way forward, but we want to focus here on putting to bed all your uncertainties and get you excited about making the switch. Finding yourself tolerating those silly flimsy wings getting stuck somewhere they’re not meant to be? Not with Bloom and Nora, no sticky wings in sight. We promise you if you make the switch that will be the second thing you notice, the first will be how soft they are. It's a fact; cloth pads are so much more comfortable than throwaway pads. They will last 4-6 hours between changes too and are so well designed, they will stay perfectly in place during the park run and handle your downward dog, without the slightest hint of a leak. Worried about the washing? You wash your knickers, right? Well, our cloth pads just go in your normal 40 degree wash. Throw them in and hang up to dry like your favourite pair of comfy pants and these little guys are ready to absorb again and fight the monthly fight against Aunt Flo. No more stressed or late night trips to the shop after you have run out, especially if she has made an unexpected return, you are always battle-ready. 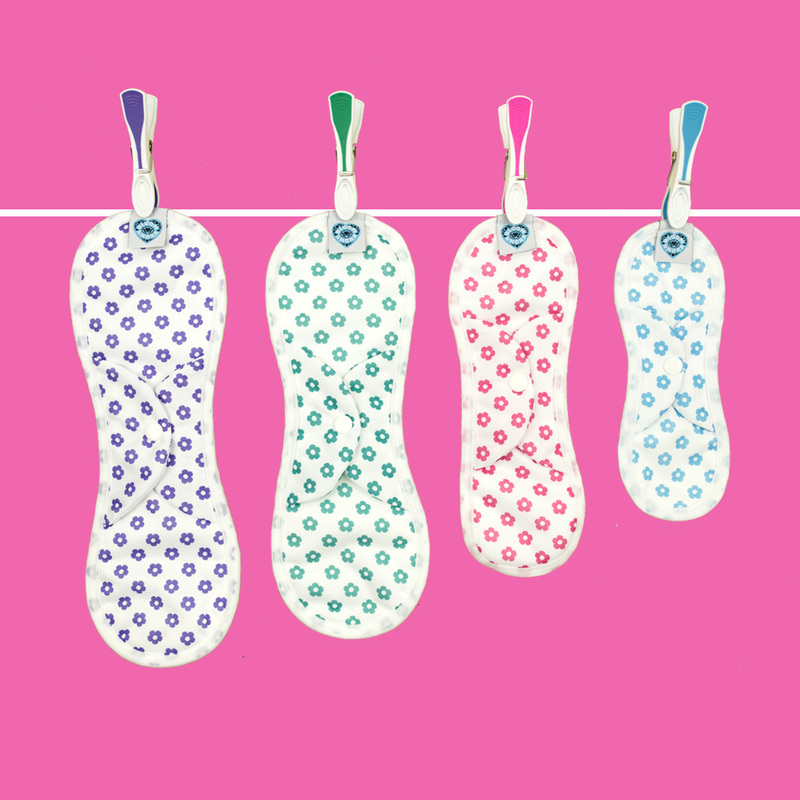 We all love the fresh whiteness of new pants and let’s face it period stains are a pain, but did you know that Bloom and Nora cloth pads are designed to stay the colour we made them. Just give them a quick rinse under the cold tap, before you pop them in the bag and wash within 48hrs. A handy tip is to completely avoid rinsing with hot water as this can set stains. Wash with non-bio power and don't use fabric softener. It could be that it’s the thought of carrying them around with you is putting you off a bit. We have this in the bag too, quite literally, with the little out and about bag. Dinky, adorable little bags that are discreet and waterproof! With two compartments, so you can put your freshly laundered pads in one side and the ready to wash cloth pads in the other. The zip lock keeps everything locked away so you can throw it in your bag and not worry. In short, our cloth pads give you two options; Bloom for a completely natural experience with a bamboo absorbency giving you full protection against any type of leak and Nora our stay dry, stay white pads which are also perfect for stress incontinence. Both pads are super fluffy, free from chemicals, have poppers to secure to your underwear and can be washed and dried with your smalls. They can be used again and again saving more single-use plastic ending up in landfill, and your hard earned money too. You can give them a go by buying one of the Bloom & Nora mixed trial packs and see which ones you like. Join the revolution of cloth pads and have a cycle in style with Bloom & Nora.